Discussion in 'GBAtemp & Scene News' started by FAST6191, Aug 30, 2007.
periodic table app for the DS. 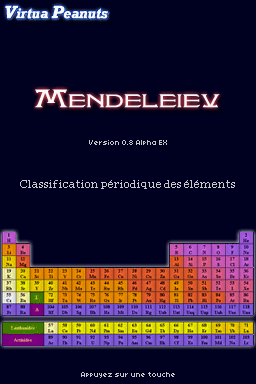 MasterDje has released a new version of Mendeleiev, for those unaware Mendeleiev is a periodic table and element information/list application for the DS. Sweet. Is this available only in French? I hope they have the key properties of the elements and switchable organization standards. Will give it a try. So can anyone confirm if French is the only language this is available in? It is all French in the sourcecode, it should be easy enough to use though. They would not allow you a periodic table/databook in Chemistry falcon64z8? Fer is French for Iron(Fe), so not the same as the English.. Although i agree, the French equivalent of most elements is just sticking a "le" on the front. This is really very nicely done. I'd love to see it developed into a full chemistry tutor with info about molecules and different types of bonds and such, especiually the organic stuff. Over in Japan they have commercial releases to fill these niches, but at least in the West we have homebrew developers to do off the wall stuff that most people don't want, but a few really do. if it were english, i might be interested... but french?